I-play has released Pigeon Squadron, its latest iPhone game. You take on the role of a pigeon, unloading last night’s dinner onto unsuspecting people, animals and cars below. Nothing is safe from a good dousing of the white luck, as we shall call it. Joining an elite team of paramilitary pigeons means progress is made via challenges and missions. Be it a group of pesky ducks that need to be brought down a peg or two, or a nasty man, one of the four playable pigeons will have to work their magic to move onto the next level. In real life, pigeon poop can be a real nuisance. Not only is it unsightly, it can carry diseases and corrode building materials such as concrete, wood and steel. Pigeon droppings can corrode paint on cars and boats, and can be quite difficult to remove if left alone. If you have pigeons on your home or business, Bird-B-Gone offers a complete line of effective, humane bird control products for virtually any situation including pigeon spikes, pigeon netting, pigeon traps, pigeon sound deterrents and more. Not sure which product to use, or whether or not you can install it? Bird-B-Gone can get you in contact with a bird control professional in your area, call us at 1-800-392-6915. Submitted by NewRochelle101 on Tue, 07/06/2010 – 22:18. On the holiday weekend there was a fun and free New Rochelle trolley tour about local history. During the tour, tour guide and Habitat for Humanity director Jim Killoran mentioned the Post Rider plaque installed in downtown New Rochelle outside of the HSBC Bank. 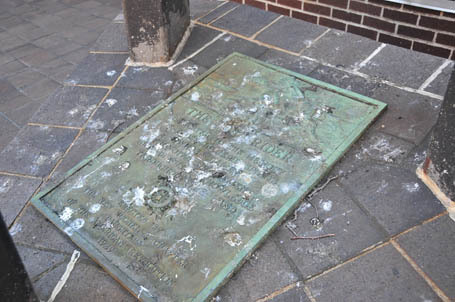 Pigeon droppings are not only unsightly, left unattended they can corrode building materials such as steel and stone, can stain surfaces, and discolor paint. Installing bird deterrents is a simple way to keep surfaces free of bird feces. A few bird spikes on the top of this sign would surely take care of the problem! They are easy to install and require no maintenance, and easy humane way for New Rochelle to preserve a part of local history. Visit Bird-B-Gone, Inc for a complete line of effective and humane bird control products!